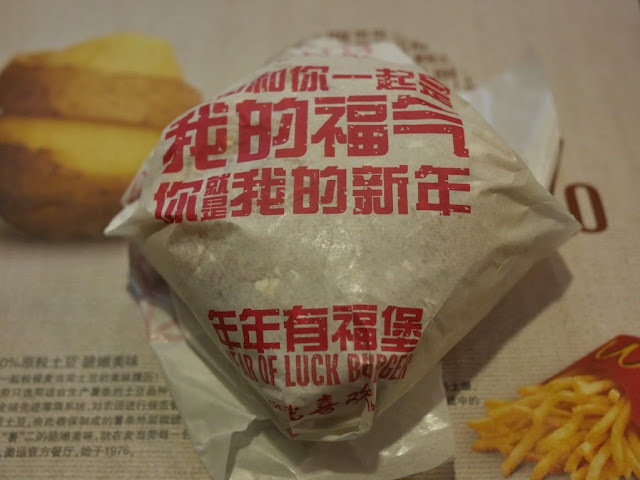 Last year, I wrote about McDonald's "incomparable" Prosperity Burgers — a special localized menu item available only near the Lunar New Year in places such as Hong Kong, Indonesia, Malaysia, and Singapore. For some reason, they are not available in mainland China. 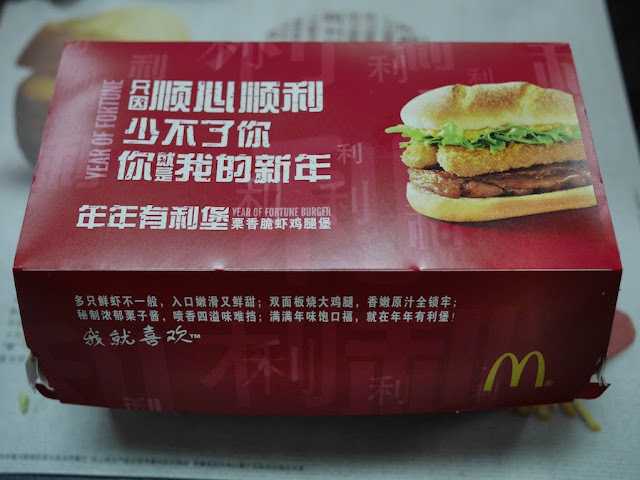 Instead, for the holiday this year in mainland China McDonald's offers two other special burgers. They don't look anything like a Prosperity Burger. Nor do they look like something I would want to eat. But I have been deceived by appearances of food in China before, so I decided to give them a try in Chongqing. I started off with the Year of Fortune Burger (年年有利堡). The main ingredients are a slice of chicken with a layer of skin topped by two fried shrimp sticks, lettuce, and a mayonnaise-based sauce. After one bite, I wasn't feeling the fortune. After a second bite, I removed the shrimp sticks, took the skin off the chicken, and scraped off the mystery sauce. I found it passable after that, somewhat. I left the McDonald's. After walking a couple of blocks, I worried if I waited much longer I would not be able to convince myself to finish this important project. So I stopped by another McDonald's. 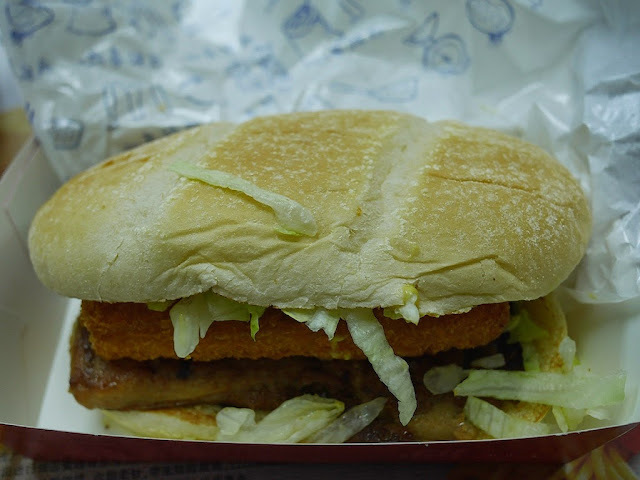 Now was time to try the Year of Luck Burger (年年有福堡). It was not packaged in a box like the Year of Fortune Burger, possibly because it did not require as much structural support or shielding. I thought the main ingredients were two pork sausage patties topped by a tomato, lettuce, and mystery sauce. I thought . . . I took one bite into the burger and was overwhelmed by unexpectedly high levels of pork flavor. That is not a tomato on top of the sausage patties but instead something like a ham patty. I took a second bite, considered whether I could rescue the burger, and determined my luck had run out for the moment. Fortunately for McDonald's, I am probably not their target customer for these burgers. Perhaps others in China enjoy them. 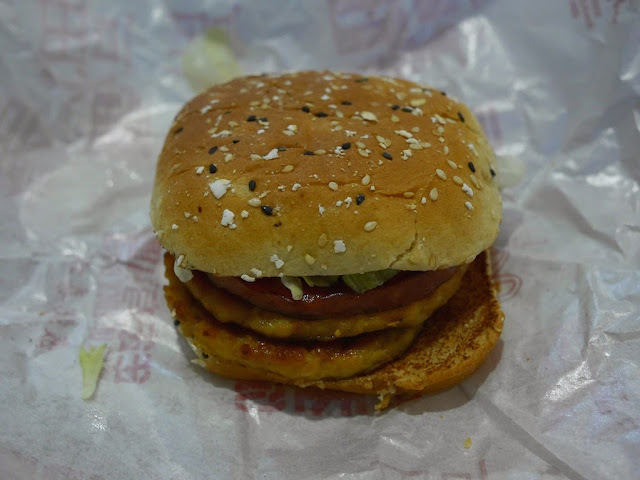 But for me, the Prosperity Burgers far outshine their cousins in mainland China. What to Do About China's New Year Yang?